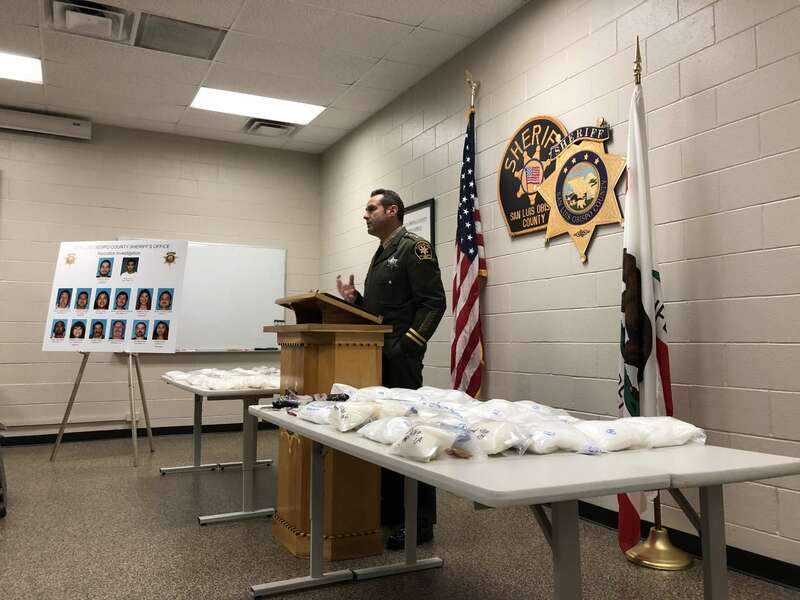 A narcotics bust involving 14 individuals was announced by the San Luis Obispo County Sheriff’s Office Thursday morning. Nine suspects are in custody and the other five have warrants out for their arrest, according to a press release. The 14 suspects have charges of narcotics distribution filed against them. The five still at large are 25-year-old Enrique Garcia of Cambria, 20-year-old Eduard Sanchez of Los Angeles, 22-year-old Gabriela Bucio of Cambria, 50-year-old Kimberley Fisher of San Luis Obispo and 20-year-old Norma Bucio of Cambria. The narcotics investigation has shut down a major methamphetamine and heroin distribution network. Nearly $1 million worth of narcotics were seized, including 63 pounds of methamphetamine, 3 pounds of heroin and 28 pounds of cocaine, according to the press release. The arrest of the purported ringleader, 45-year-old Jaime Vega of Paso Robles, in November 2016 led officials to the larger drug-trafficking organization in Mexico which had multiple cells throughout the U.S. Garcia is believed to have fled to Mexico. Though operating in San Luis Obispo County, the network was believed to have had connections in San Bernardino County, Santa Barbara County, Ventura County and Los Angeles County. The San Luis Obispo County Sheriff’s Office was assisted in the investigation by the Drug Enforcement Administration, District Attorney’s Office, Probation Department, California Highway Patrol, Homeland Security Investigation, L.A. Impact, Los Angeles County Sheriff’s Office, Ventura County Sheriff’s Office and the Glendale Police Department.